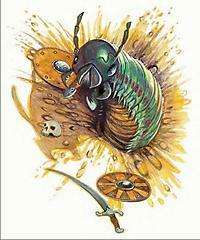 Speed: 20 ft. (4 squares), burrow 20 ft.
At the bottom of a sandy pit lies a bristled horror with enormous, hooked jaws. It looks like a fat-bodied louse but is the size of a warhorse. A giant ant lion is the larval form of a giant insect that resembles a dragonfly. It spends almost its entire life in larval form, voraciously consuming giant ants or anything that stumbles into its trap. Giant ant lions are perfectly adapted to trapping and devouring prey. They dig slippery pits in loose sand and hide themselves at the bottom, with only their outsized jaws protruding. If a creature comes too close to the pit’s edge, it falls in and slides toward the waiting predator. A giant ant lion is expert at knocking down hapless creatures that try to escape the trap, and its body has thick, forward-pointing bristles that keep it from being pulled out of its pit once it has seized its prey. A giant ant lion finds a dry slope of loose, sandy soil and digs its way in backward, hurling sand out in circles until it has formed a funnel-shaped pit about 20 feet deep. It lurks there and waits for a creature to slide in, then grabs it with lightning speed and paralyzes the prey with its poisonous bite. Constrict (Ex): A giant ant lion deals 2d8+6 points of damage with a successful grapple check. Improved Grab (Ex): To use this ability, a giant ant lion must hit a creature with its bite attack. It can then attempt to start a grapple as a free action without provoking attacks of opportunity. If it wins the grapple check, it establishes a hold and can constrict. Pit (Ex): The pit of a giant ant lion fills four adjacent 5-foot squares and is 20 feet deep. It isn’t hard to recognize, requiring a DC 10 Spot or Survival check to notice. Charging or running characters are not entitled to a check. A creature that does not notice the pit can make a DC 17 Reflex save to avoid falling in. A creature that falls into the pit begins to slide to the bottom at the rate of 10 feet per round. A DC 17 Climb check is necessary to arrest the slide, and struggling out of the pit requires a DC 22 Climb check. Poison (Ex): Injury, Fortitude DC 17, initial damage none, secondary damage paralysis 1d6 rounds. The save DC is Constitution-based. Sand Burst (Ex): A giant ant lion can hurl sand at a struggling creature to knock it from the pit walls. It makes a ranged touch attack; on a hit, the target must make an immediate DC 22 Climb check or slide 10 feet toward the bottom of the pit. Skills: Giant ant lions have a +8 racial bonus on Hide checks. *This bonus rises to +12 when buried in their sandy pits. They also have a +4 racial bonus on Listen checks.